Sure, Geoffrey Rush and Johnathan Thurston have been pretty successful, but it’s hard to argue that the most historic and renowned icon to come out of Toowoomba is its annual Carnival of Flowers. 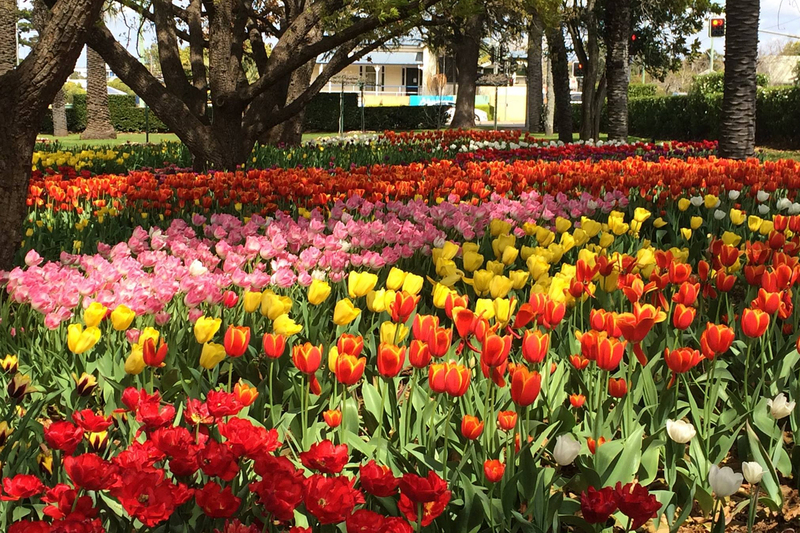 This year, the event that earned Toowoomba its reputation as “The Garden City” is promising 176,000 beautiful blooms but we’re going for the 176,000 different ways to gorge ourselves. Since 1949, The Carnival of Flowers’ foodie offerings have blossomed from local legends like Pickwick’s Baked Spuds and Shannon’s Chips into a fully realised celebration of the best food and booze Toowoomba has to offer. Whether you’re a Carnival vet or making your first trip down the Warrego, we’ve got the scoop on how to make the Carnival of Flowers one delightfully tasty time. Kick off the festivities with a glamourous night of sophisticated style and elegant eats as you dine under the stars among the gorgeous gardens of Laurel Bank Park on Thursday 20 September. You’ll have plenty of time to soak up the scenery as you work your way through this incredible degustation that begins with canapés before launching into a four course journey across rural Queensland featuring Darling Downs venison carpaccio, tempura zucchini flower and seasonal vegetables, Herron squabs from Superior Game Birds Pittsworth and a Seatonfire Carnival Fig Tree filled with chocolate and port mousse. I hope my suit still fits. Heritage Bank Festival of Food and Wine. The Carnival’s flagship foodie event is back and bigger than ever from Friday 21 to Sunday 23 September. Displaying an impressive collection of flavours gathered from all corners of rural Southern Queensland, even celebrity chefs Adam Liaw and Julia Busuttil Nishimura are joining the party. Learn the berry delicate art of wine tasting with guest speaker Michael Hayes (the 2017 Queensland Winemaker of the Year, not the wrestler) at the Wine Bar, accompanied by the Robin to Wine’s Batman, a fine selection of artisan cheese. Hit up The Shed for a taste of the equally iconic pairing of Beers and Barbeque. The tasting sessions are a must for anyone looking to expand their arsenal of ale or who, like us, simply refuses to miss any opportunity to down a few bevs while enjoying barbeque wood-fire meats. No meal is complete without desert and Seatonfire Chilli Chocolate are more than up to the task of satisfying our sweet tooth, all while revealing the secret to decorating the perfect desert and demonstrating how to make tantalising truffles and mousse. The Festival of Food and Wine is your best chance to indulge on an astounding array of food and drink, all scored by live music, against an aesthetic, flowery backdrop. Speaking of celebrity chefs, Julia Busuttil Nishimura is hosting a special brunch to speak about her new cookbook, “Ostro” at Gip’s Restaurant on Sunday 27 September. If you’re in the market for tips and tricks in the kitchen, one of the best chefs in the game is a pretty good place to start. A night crawling across four of Toowoomba’s favourite pubs is an absolute rite of passage for anyone recently turned eighteen in the Garden City and this Carnival, you’ll have the chance to experience this night of booze-fuelled fun for yourself on the Talking Pubs Tour. Spend four glorious hours touring Fitzy’s, Muller Bros, The Spotted Cow and The Irish Club with a drink and a bite at each stop. Those with more, shall we say, particular taste might be more at home on the Progressive Foodie Tour, a three stop voyage where history meets gourmet dining. On Friday 28 September, begin with canapés at Urban Grounds Café before arriving at the historic railway station where you’ll enjoy your main in the adjoining Inbound Restaurant and finishing with desert at Encores Restaurant; a part of Toowoomba’s iconic Empire Theatre. Still have room for more? We’re not judging, we’ll also be back on Saturday 29 September for part two starting with canapés at the famous Cobb & Co. Museum, then dinner at the revamped 1860’s mansion that now houses Gip’s Restaurant before desert at the scenic Picnic Point. Ten days to test the capacity of your stomach are waiting at the top of the Toowoomba range (also something about gardens) so put on your fanciest, stretchiest pants and let’s hit the highway. - The gourmand whose favourite flower is the kind you use to make a cake.